Exciting stuff to see our local eateries getting some out of town coverage! We hope to continue this trend with some upcoming projects, stay tuned. Guilded Table Opens in the Funk Zone! Check it out here as Noozhawk covers the opening of the Guilded Table Artist Collective which shares the space with Lama Dog Tap Room, The Nook, Topa Topa Brewery and Fox Wine Co. The Guilded Table is a place for artisans and artists to create their work within the Funk Zone. We that this support of the arts community is a critical component of the fabric of the community and helps to maintain the authenticity that draws so many people to the Funk Zone. I hope you have a chance to come and check out the popular space at 120 Santa Barbara St, stay for a drink and some food! 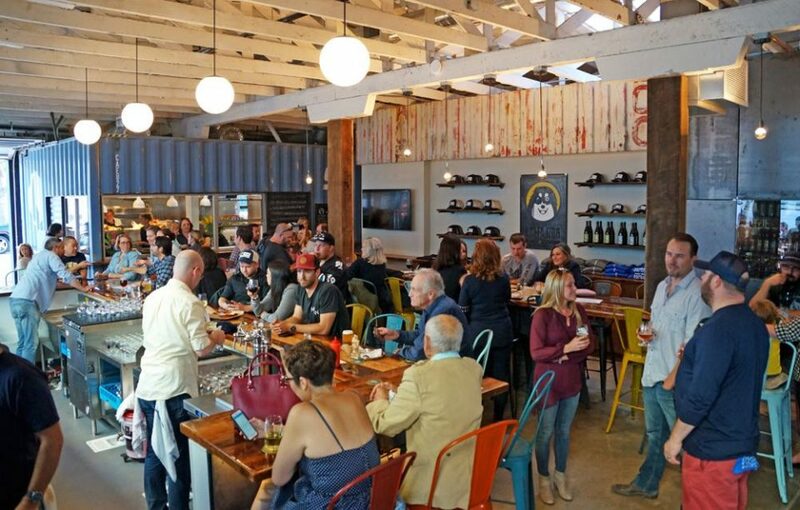 Some kind words about our latest creation in Santa Barbara’s Funk Zone The Nook and Chef Norbert are featured in this months 805 Living. Its great to see Norbert and his crew getting the recognition they deserve, they are consistently putting out great innovative food like lobster mac’n cheese (my kids favorite). When you pair this great food with the beer and wine options provided by Lama Dog you have a combination that is hard to beat, a fact that many people agree with judging by the crowds! The Waterline will be adding Topa Topa Brewing and a wine tasting room for Blair Fox Wines in the next few months! The Funk Zone getting some love in the Los Angeles Times. This happens to be the location of our Funk Zone Lofts, our Beer and Wine Tasting Room and a few other projects early in the design process. “Let’s be honest. Do you want to spend a weekend in a place called the Funk Zone? The first time I heard the name, I wrinkled my nose. It sounds like something from the ’80s that smells — or looks — distasteful. When I found out it’s a tourist zone in the otherwise perfectly lovely town of Santa Barbara, I thought it needed a name change, at best. Most non-Santa Barbara residents I mentioned it to agreed. “Why did they name it that?” people wondered. We have a new project underway in Santa Barbara’s evolving Funk Zone! If you are not familiar with this area it has a mixture of uses and architectural styles and has become a destination in itself for wine tasting, high quality restaurants and shops. For Santa Barbara Architects the Funk Zone is a special place, it allows for experimentation and creativity in a city known for a particular style. It is also home to our live work / mixed use Funk Zone Lofts project on the corner of Yanonali and Gray. This new project will add to this mix as a new beer and wine bar with a full kitchen coming in the future. This project will add to our growing list of restaurant design projects which are fun to be involved in. With this design we are looking to take advantage of the character of the existing structure and are trying to add layers of texture and color while opening up the walls to allow light in. We are also opening up the wall to allow for indoor and outdoor service a the bar for the small outdoor seating area. Take a look and let us know what you think!